The next bimonthly BAC Legislative Committee Meeting will be held April 2 at 6:30pm. The meeting will be held at the Two Rivers PCS Middle School, 1234 4th Street, NE. The meeting will be short, 30 minutes, so that we can participate in the District Department of Transportation meeting regarding the rebuilding Florida Avenue, possibly with bike lanes or cycletracks. The Transit Benefits Establishment Act of 2013 was withdrawn and reintroduced as part of B20-573, the “Sustainable DC Omnibus Act of 2013.” BAC sent a letter of support for the withdrawn act and should probably send (the same?) one for the reintroduced bill. 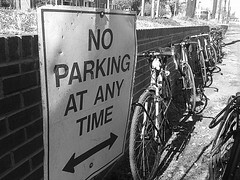 The bike parking regulations, originally required as part of the 2007 Bicycle Commuter and Parking Act, have been completed by DDOT and are now available for comment. We will review these and recommend comments. The comment period ends before the next BAC meeting. Please feel free to contact the committee chair, David Cranor for meeting details or topics of discussion.